The ACLU of Virginia today leveled strong criticism at amendments proposed by Virginia Governor Terry McAuliffe that would gut important bipartisan privacy legislation passed during the 2015 General Assembly Session unanimously or almost unanimously by both houses of the Virginia legislature. In a letter sent to the Governor today outlining its concerns, the ACLU of Virginia urged him to rethink these amendments and join the members of the General Assembly in opposing them when the General Assembly returns for the reconvened session on April 15. “It is difficult to understand why the Governor would propose amendments to pro-privacy legislation that would authorize unrestricted mass surveillance of Virginians by police and government agencies,” said Claire Guthrie Gastañaga, Executive Director of the American Civil Liberties Union of Virginia referring to HB 2125 (Cline R Rockbridge and Gilbert R Shenandoah), SB 1301 (McEachin D Henrico), HB 1673 (Anderson R Prince William), and SB 965 (Petersen D Fairfax). “The Governor’s recommended amendments to these bills, which would regulate the use of drones, license plate readers, and other mass surveillance technology by police and regulatory agencies, are equivalent to vetoes,” Gastañaga said. “Virginians’ liberty is at risk when police surveillance and data collection practices intrude on their privacy when there is no evidence that they have engaged in any wrong-doing,” Gastañaga continued. “The legislation to regulate new surveillance technologies that was presented to the Governor was compromise legislation that offered Virginians greater protection of privacy and liberty and preserved the ability of law enforcement to investigate and prosecute criminals,” Gastañaga said. 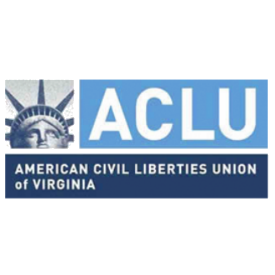 The ACLU of Virginia will ask its members, supporters, and allies, who represent a broad cross-section of Virginians united across party lines and traditional ideological divides in support of this legislation, to urge their legislators to reject the Governor’s proposed amendments and to vote to pass the legislation as presented to him “notwithstanding the Governor’s veto” so that it will go into effect on July 1 as the General Assembly intended. House Bill 2125 and Senate Bill 1301 would require law enforcement and regulatory agencies to get a warrant from a court before they could use a drone, except in certain emergency circumstances, like Blue and Amber alerts and in situations not involving law or regulatory enforcement. As presented to the Governor, the bills prohibit evidence obtained by a drone without a warrant from being used in criminal and enforcement proceedings. The Governor’s amendments would gut the warrant requirement in the legislation. As passed by the General Assembly, the legislation would strengthen privacy protections beyond the protections now offered by the Fourth Amendment as interpreted by the courts in pre-digital age decisions. If the Governor’s amendments are accepted the new statutory warrant requirement becomes meaningless. House Bill 1673 and Senate Bill 965 would clarify that current Virginia law (the Government Data Collection and Dissemination Practices Act) prohibits law enforcement agencies from using mass surveillance technologies to collect and store personal information (including license plate numbers) unless engaged in an active criminal investigation. The bills would create an exception to current law that allows the use of license plate readers to collect personal information and keep it for a maximum of seven days, unless part of an ongoing investigation. The Governor’s amendments would eliminate restrictions on the use of mass surveillance technologies by law enforcement and allow law enforcement to maintain data collected by license plate readers for 60 days or more depending on whether the data is related to a criminal investigation.